I love gadgets, as a quick glance around my office would confirm. In particular, I seem to have the gene that favors small, battery-powered boxes that light up—my iPhone, iPad, Apple Watch, digital camera, digital name tag, and laser pointers, for example, all meet that general description. Even so, I buy only those gadgets that I think will actually perform a useful activity or make my life better in some way. I reject otherwise cool gadgets that would not in fact be valuable as part of my lifestyle. It was therefore with a mixture of gadget-crazed glee and circumspect puzzlement that I first looked at a device sometimes known as a “brain machine” or “mind machine” a couple of decades ago at a Sharper Image store. That it was a small box containing batteries and blinking lights was enough to induce me to pick it up; it also had cables running to a set of headphones and what appeared to be sunglasses with a bunch of LEDs mounted on the inside. The marketing propaganda said that the device was supposed to promote relaxation and “synchronize” one’s brain waves, whatever that meant. Out of idle curiosity I put the apparatus on and pressed the button. 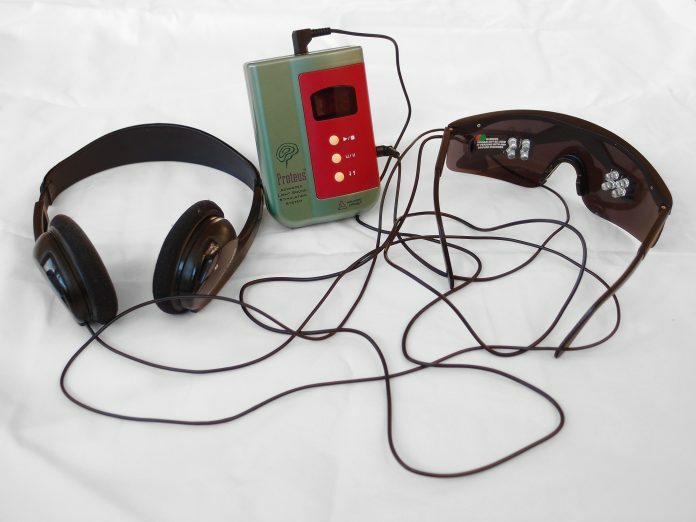 The LEDs on the glasses started blinking and synthesized sounds poured out of the headphones. I only used the device for a minute or so, but I was almost immediately struck by the sensation that I was somehow moving into an altered state of consciousness. To be quite honest, it was a bit freaky—fascinating, sure, but not something I really cared to experience standing in the middle of a store. I thought it would be well worth about US$50 to take home and experiment with, but the cost was quite a few times that, and I really couldn’t bring myself to spend hundreds of dollars on a box that made sunglasses light up. Years later, I stumbled upon a much lower-tech (and cheaper) version of the device in another store, and I decided the price was low enough for me to satisfy my latent curiosity. Once again, the literature stated that it aided relaxation, promoted mental clarity, relieved tension, improved creativity and learning ability and so on—all rather vague and unfalsifiable claims. I took it home and tried out several of the programs. The first thing I noticed was that the blinking lights—which you see through closed eyelids—produce a subjective impression of complex patterns, colors, and motion, even though the only things that vary are the rate of blinking and alternations between the lights on left and right sides. Depending on which program I chose, the pattern of blinking differed significantly over a period ranging from 10 minutes to an hour. All the while, a wavelike drone of white noise came through the headphones—a distinct disappointment compared to the higher quality (and more interesting) synthesized tones of that first unit I tried. I could have just plugged in another audio source and listened to whatever I wanted, but I was hoping for an integrated audiovisual experience. Using the brain machine was indeed relaxing, though some sessions were more successful than others. On a few occasions, I had the distinct impression of viewing a scene before me—such as a room full of furniture—even though my eyes were closed and the only visual stimulus was the blinking LEDs. And once or twice, I spontaneously felt a very strong emotional response, almost like the terror of falling, that I could not attribute to anything external. So clearly the device had some effect, though precisely what it was doing I can’t say. It’s also not clear whether my experience would have been the same with other models; it seemed the particular device I chose was designed rather sloppily, without any real attention to the underlying principles of how the brain works. And what are those principles? The idea behind brain machines is relatively straightforward and scientifically sound (as far as it goes). For many years, medical researchers have known that there is a correlation between the frequency of people’s brainwaves and their mental states. Higher frequencies are associated with normal waking consciousness; progressively lower frequencies correspond to relaxation, sleep, and deep meditation. The brain also has a tendency to synchronize its frequency with external stimuli such as lights and sounds, in much the same way as a tuning fork vibrates when exposed to a sound of the right pitch. The brain’s synchronization process is called entrainment, and it is exactly what the brain machines aim to produce. In theory, at least, by blinking lights or playing sounds at certain frequencies, the machines can encourage the brain to fall into sync, inducing very relaxed, meditative states. Every brain machine on the market—and there are many different varieties—claims to aid relaxation, and used properly, they usually will. Other claims are somewhat more dubious. For example, I’ve read in several places that by using a brain machine, one can achieve meditative states that would take a monk or yogi 20 years of training to reach. I have to wonder about that. For one thing, most brain machines don’t include EEG circuitry to produce a record of the actual state of your brain or provide biofeedback, making claims about meditative states hard to verify. But even if it is true that one’s brain is operating at the same frequency as a Zen master’s, that by itself doesn’t mean much; the same could also be true of someone on drugs. I’m not sure it’s fair to say that simply reaching a certain brainwave frequency is somehow equivalent to the experience of spending years of disciplined training in meditation. On the other hand, unlike drugs, brain machines are legal, safe, and nonaddictive—which must count for something. In addition to the standard “light and sound” brain machines, there are several audio-only programs that purport to have approximately the same effect. You can also buy machines that eschew light and sound altogether for a more direct approach: delivering tiny electrical pulses through electrodes attached to your head. Supposedly this accomplishes the same thing, but I find the idea of zapping my skull a bit off-putting. Without question, not all brain machines are created equal, but there is no good way to evaluate competing models objectively; you have to try them out. Unfortunately, nearly all of them are far too expensive for what they do, so experimenting with a range of models is not a reasonable prospect for most people. Still, the experience of using a brain machine is one worth having, and depending on what type of machine you have and how you use it, you may find its value in promoting relaxation or reducing stress well worth the price. As for me, I’ll be looking on eBay for a high-end unit whose owner says they’re selling it because they’ve achieved enlightenment and want money to give to the poor. Note: This is an updated version of an article that originally appeared on Interesting Thing of the Day on June 25, 2003, and again in a slightly revised form on June 9, 2004.